Everyday Beauty: I love aprons! I always have. I started collecting them in high school when my mom and I would go on antiquing outings together. She has several, one of which was my great-grandmother's. 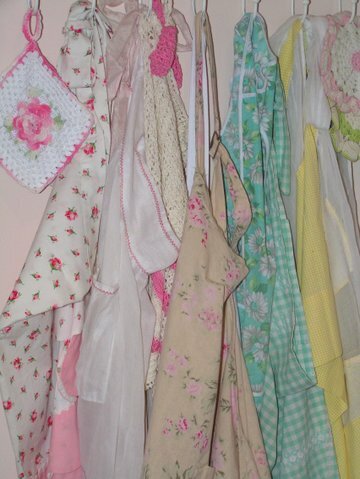 The picture above shows a few (mostly vintage) aprons that are hanging in my kitchen at the moment. Of all of these, I really only wear this one. I found it in a gorgeous little boutique in Denmark. Rachel Ashwell herself could've decorated that store. I wanted to spend hours studying every little detail. Anyway....it's my baking apron. 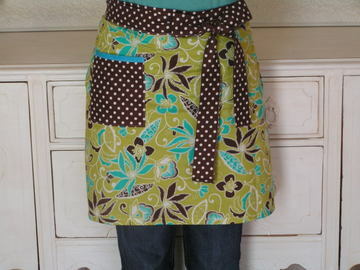 Many batches of cookies and cupcakes have been made while wearing this apron! I have been admiring Carrie's aprons for months and finally bought one! I hastily opened the package and tied it on.....and kept it on for several hours. It just made me feel like cleaning and cooking and dancing around the house. What is it about an apron that makes you feel so.......well.........happy? Has anyone else ever experienced this? I can't imagine it's just me! The ties are extra long so you can wrap it around your waist twice and tie a big June Cleaver bow. Love. This. Apron. Even though you only have a couple of posts, I can see that you will become one of my favorite blogs, you love what I do! I adore your apron collection, sold mine years back before a move, but you have inspired me to go ebaying again! Looking forward to reading each day! Maybe that's what I need....an apron....will it really make me want to clean???? It's worth a try!!!! Really, I love your collection...so beautiful! i have seen so many aprons of late, it makes me want one too. i made one years ago, and after 5 years of it hanging in the broom closet, and never wearing it once, i got rid of it. seeing these, knowing i'll still never wear one, makes me long for a collection of my own. thanks for sharing! oh yes! I love aprons too. i'm going to have to treat myself to one of carrie's aprons soon, yours is so adorable. of course, i also looove the one you bought in denmark. Love the vintage aprons (can one ever have too many?) I'm so jealous of your great antique finds!!! (And I'm a VA gal too! From Norfolk! So nice to meet you!) I'll be sure to check back often to see what other great things you find! Hi there! I *love* aprons too! Your collection is beautiful, especially your favorite! 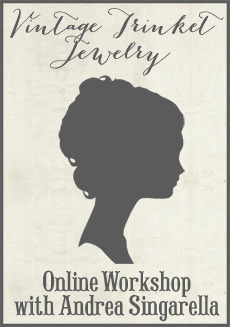 How fun to see you're just getting started here in blogland, welcome! By the way... Jenny sent me! Love these aprons, just darling! Ohhh What a fab collection!! Super sweet! Aprons are an excuse to play dress up..or play house don't you think?